File Blog Post Under :- Kuriology senseless mumbling & rambling thoughts. Like most people, before I started to try to sell things on the inter-webbery line I did a bit of research. However, obviously & clearly I may not have done quite enough? You have to have a Unique Selling Point...they said? You have to find/create a Niche Market...they said? You have to be exclusive & OOAK (*One of a Kind)...they said? You have to be way, way out there...they said? Ok, cracked it....I thought? Unique Selling Point...which one, I have several? 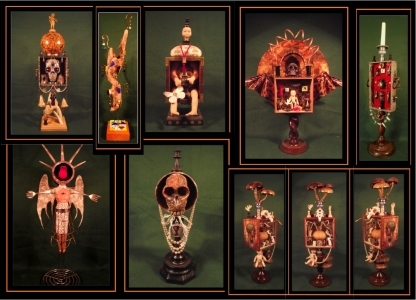 Cabinet of Curiosities, Wunderkammer, oddities which are hand crafted & from sustainable materials. Come on, I'm creating 'Rubbish Art'! Hmmm, that does not sound right, 'Crap Art', no that's no better. Creating Object d'art from recycled/re-purposed materials - better! My Niche Market - 'in theory', would appeal to people who really like the individual, interior decor items comprising of the strange, unusual, different, weird, exclusive, & unique. 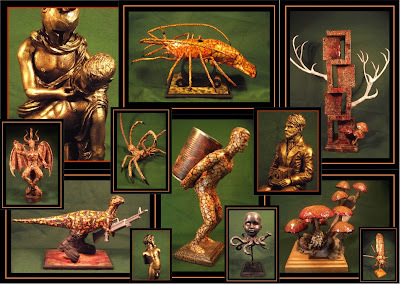 Those who wish to add the OOAK, diverse & contemporary bizarre to their own home Wunderkammer? Surely, I'm so 'out there' I'm almost on the other side of the Galaxy? Ah, but is my 'Niche Market' actually so niche it is a Macro-Market or even Micro market? Are there far fewer 'collectors' of Oddities for personal 'Cabinet of Curiosities' than my research had led me to believe - or are these collectors all collecting exactly the same things - so one 'oddities' collection actually pretty much looks the same as any other? Therefore - not really so odd? I think I have the USP & niche market, but am I possibly simply selling on the wrong corner of the internet commercial street? Currently my eBay gross sales exceeds that of esty at a ratio of '£10 on eBay' to every '£1 on etsy'. Etsy, perhaps not all it's quite cracked up to be for the *unique creator/artist seller*? ...or did I just miss the etsy boat? Certainly considerable dissatisfaction is loudly expressed by some old etsy hands in the forums at the direction & flow of etsy in recent years? Especially given the number of 'oh so similar', almost identical jewelry makers, bead threaders & knitted 'this 'n' that' creators,(I genuinely found knitted poodle toilet roll covers that were gravely unfashionable & poor taste kitsch even when my gran had one in the 1970's) - but they sell. Then there is the designer created (but made in a factory in the far east) mass produced items. Items I've disappointingly personally seen & discovered prominently on etsy or is it just still very early days for my particular individual work yet to settle in & find customers as unique & individual as is Kuriology Art? If you came here expecting an answer to - 'How to establish an etsy & eBay Unique Selling Point (USP) and an Exclusive Niche Market' - I was actually pondering the question, not providing the answer!